I haven't done much today due to a slight illness (basically, I ate more peanuts than any human being should ever eat in one go and suffered the consequences), so I took things fairly easy, didn't do my scheduled podcast, and just played around with my blogger layout instead. The result was that I have now not only ditched Disqus (and started afresh with the comments), but I have also temporarily removed LinkWithin (which has been annoying me for quite some time by forcing me to add pictures when I really didn't want to and showing posts which I've deleted), the "Most Popular Posts" (which haven't changed in over a year), and the completely useless "Blog Archive" (which just took up space and nobody used anyway). If you need to find something, I recommend the page links on the navigation bar under the logo, and, of course, you can use the search box. I also deleted a lot of the monetising mainly because I'm not making anything from any of the adverts. Unfortunately, I'm not a pretty girl blogger who you all want to fall over yourselves agreeing with or supporting with donations just because you think you'll get something in return. Reality check, people, that isn't going to happen on those mediocre blogs by pretty girls who use the angles for their one good profile picture either. I am no longer pandering to the popularity contests (not that I ever did much) so I'm not going to play the number of GFC followers game. I'll follow who I want to if they interest me or not follow others if they don't. I'm lazy with it though so the chances are that if I'm already following your blog, I'll stay following it unless you give up writing. As tempting as it was to remove the GFC gadget, it's there for your benefit not mine. If you have a Blogger account then it will always be the easiest way to subscribe. Of course, the RSS feed itself, Twitter and my Facebook page for this blog are just as useful for keeping up with my latest posts. 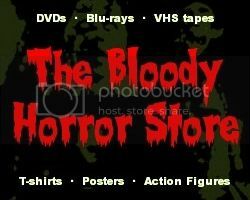 Having said all that, I have cleared a lot of dead blogs from "The Bloody Blogroll" earlier - the current total is 80 - mainly because at least 200 horror bloggers have given up. It's very sad, but there just aren't that many of us left now. My blog, although still definitely geared towards the horror genre, is changing to be about whatever I damn well feel like posting or reviewing whether it's an old movie from the 1940s or the latest remake. I can't compete with the teams of reviewers on the bigger sites and, truth be told, I don't really want to either. If I find something interesting then perhaps you will too. I've written approximately 1000 horror movie reviews so far. Most of them are as crappy as the movies themselves, some are longer and more informative than others, but they are all 100% honest. I may go back and rewrite a few of them one day even though it would be more work than necessary, but I'm not going to change my mind about anything which I've already said. Anyway, hopefully, at the very least, my blog will load a bit faster now, and I can concentrate on writing rather than trying to satisfy the requirements of the less than helpful widgets.